Farmers markets are popping up in the unlikeliest of places these days. In the heart of Tokyo’s Aoyama/Omotesando high-end fashion district, the Farmers Market at the United Nations University has grown into a regular weekend fixture. Over 40 stallholders sell fresh fruit, vegetables, plants and flowers, as well as rice and a variety of other foodstuffs, most of it grown by farmers based in the Kanto plain area. The market’s motto is “Water, sun and the earth”, bringing together the themes of culture and cultivating. The trend is getting a boost from the government through an initiative called Food Action Nippon that has the ultimate goal of raising Japan’s food self-sufficiency ratio (calorie based) from the current 41% to 45% by 2015. The dynamic campaign features some celebrity star-power and includes not just educational events, but also a YouTube Channel and television programmes. Consumers are encouraged to take these five actions: 1) Eat seasonal agricultural products; 2) Eat local products; 3) Eat rice; 4) Reduce leftovers; and, 5) Inform themselves and use their knowledge to support national self-sufficiency and local producers. While not an official partner with the Food Action Nippon programme, the UNU is offering direct support as host of the Farmers Market at UNU. The market is the brain-child of Roswitha Lasser and Terao Kurosaki, cultural advisors to the UNU, who worked together with leading organic farmers to provide a space for the public to purchase directly from farmers. Lasser has an unapologetic passion for sustainable food and a commitment to spreading the word both on the street and through the web. One thing that concerns Lasser immensely is how our relationship to food has changed in recent years. “We started to praise consumer society and people started to earn money to spend it and not to save it,” she says. While the Farmers Market at UNU is not 100% organic, Lasser thinks it’s a step in the right direction: educating people about what they eat. That seems right and fitting for a university campus. “If you do not address normal people and spread the message to them, you will always be preaching to the small minority who already cares about this issue, maybe 1% of the population. “It is important that we understand where our food has come from and who has made it for us. I want people to experience buying food from a real farmer who loves his or her profession,” Lasser explains. Something that was not formerly easy to do in the heart of Tokyo. According to both Lasser and Kurosaki, the future looks decidedly bright for the popular Farmers Market at UNU. “I explain to the shoppers here that what they think is a normal apple is not a normal apple at all. Today we are using all the pesticides and chemical fertilisers to make the apple look perfect. 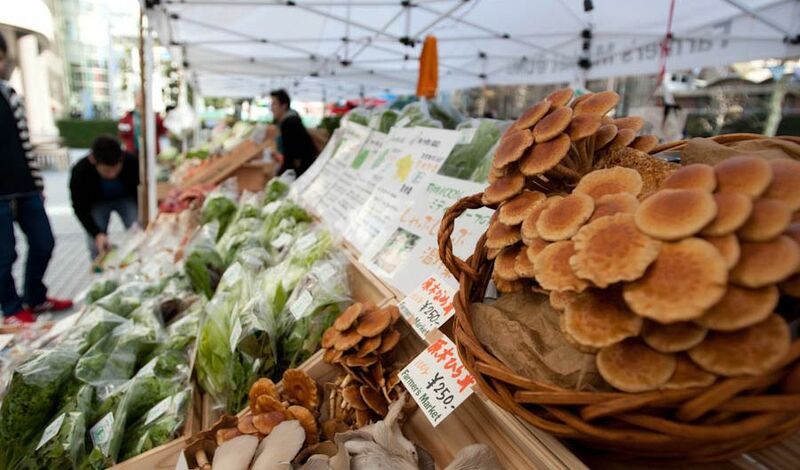 Globally there has been a resurgence of farmers markets. Last year in the United States, a comprehensive survey of farmers market trends found that 88% of farmers markets are seasonal, running for 4-5 months on average, and not all year round. The most financially successful markets are located in urban areas. The longer a market is open during the year, the better they do in terms of the number of vendors, sales and customers. For instance, the average number of vendors for a year round market in the US is 58, with monthly sales of nearly US $70,000 and around 3580 customers per week. In part this resurgence, at least in the US, has been inspired by localisation advocates like Lester Brown and writers like Michael Pollan. Pollan’s groundbreaking books, such as The Omnivore’s Dilemma: The Secrets Behind What You Eat and In Defense of Food: An Eater’s Manifesto, have awakened concerns in millions of people about the inadequacies and dangers of our current global industrial food system. “Real food — the kind of food your great-grandmother would recognize as food — is being undermined by science on one side and the food industry on the other, both of whom want us focus on nutrients, good and bad, rather than actual plants, animals and fungi,” Pollan argues. Pollan’s just-released latest book, entitled Food Rules: An Eater’s Manual, is designed to help us make wise choices about the food we eat. He is a big supporter of farmers’ markets. “In great and growing numbers, people are voting with their forks for a different sort of food system,” Pollan says. ”But as powerful as the food consumer is — it was that consumer, after all, who built a $15 billion organic-food industry and more than doubled the number of farmers markets in the last few years — voting with our forks can advance reform only so far. “It can’t, for example, change the fact that the system is rigged to make the most unhealthy calories in the marketplace the only ones the poor can afford. To change that, people will have to vote with their votes as well — which is to say, they will have to wade into the muddy political waters of agricultural policy. So why not go out this weekend and vote with our forks at local farmers’ markets and then start thinking about how to address the challenges laid before us by Roswitha Lasser, Teruo Kurosaki and Michael Pollan. The Farmers Market at UNU is held outside the United Nations University Headquarters in Tokyo. They are open from 10 a.m.–4 p.m. most Saturdays, Sundays and public holidays. To have a preview of what you can find there, visit this article’s photo essay by clicking the small black camera Gallery icon at the top right of the story. Farmers Market Comes To The UNU by Sean Wood is licensed under a Creative Commons Attribution-NonCommercial-ShareAlike 3.0 Unported License. Does the UNU Farmer’s Market have any strategy for providing discounted alternatives to low-income consumers? To Jamie,you are raising a very important topic: the prices of quality food for low- income consumers.First of all: the most expensive food you can buy is all the fast food you find at any corner at any place around the world nowadays. Just have a look how people in the developed part of the world are looking nowadays including the poor ones: they are just fat as a result of all this cheap- expensive food.The society pays the price, because we have to pay for all the medical treatment of these fat- sick people.To be more blunt with the Farmer´sMarket@UNU: yes we do care about the poorer part of the rich Tokyo society: may I invite you to the Market and you will be more than surprised about the prices right in the center of one of the most expensive shopping areas in the world. The prices at Farmer´sMarket@UNU are extremely competitive and all the customers walk away with a lot of apples and vegetables and still a lot of money in the pocket.What we have to teach to poor people, but not only them, is not so much about the price of a product, but the relation of price to quality. People lost the traditional knowledge about healthy, but reasonably priced food. We still have a lot of it, but it is not advertised, because industry does not or cannot produce it.But our grandmothers might still know.Japan has a wonderful history of offering its people the best healthy food in a beautiful way even at times when Japan was a poor country.It is a misunderstanding of wealthy societies to think of good food as easy-to-eat-ready- made-convenient-food, which is necessarily expensive, because it needs to be industrially produced, distributed, advertised etc. Good food must not at all be expensive, but it needs some work in the kitchen and it needs dedication and well, yes it needs some love and this is not a question of being rich or poor. well done guys, great work – will be shopping there soon! I bought this special rice there and it turned out to be the best rice ever! oh, and there’s this great cookie-place… love all about the market! UNU Farmer’s Market seems to be is in a very unique position. It would be interesting to see what ideas spring up to address the need for increased food access, affordability and education in an urban environment that is becoming increasingly food insecure. Working in tandem with food banks, or (if the farmer’s market receives any government funds) providing increased economic opportunities to low-income consumers–such as transport subsidies to the market, or the option of using a food stamp-type of currency (I’m not familiar with govt. policy on food assistance, but a direct “farmer’s market-ticket” system between UNU and Second Harvest Japan might be an idea)—would be a good way to start. A UNU-sponsored CSA between farmers and a low-income community (again, see Second Harvest) might also be a good idea. I look forward to hearing about any new developments! This is an interesting discussion. The issue of how to address the needs of those, even if just a single person, unable to access good food is important and an issue of social justice. I guess it relies on a host of other factors in society like fair work for pay, housing affordability and education levels. Jamie – do you have any insights on the challenge of providing for those with limited access? What sort of systems 1) ensure that people do not become fully dependent on subsidies over the long term or 2) are less susceptible to abuse by those who may be trying to hop onto a good deal? I remember that when I volunteered for a food van which provided leftover food for homeless people, the charity use to source leftover white bread sandwiches and donuts and provide caffeine drinks therefore providing no nutritional value. Hopefully these growing local, seasonal and organic food movements can change expectations and knowledge about food from the ground up, including amongst those less fortunate. Broadly, industrial food is of course underpriced and it will take a lot of cultural change for many people to even consider farmers markets. My experience is that people of all income levels are willing to fork money out on things like smoking, gambling, drinking, overpriced handbays and watches, techno stuff etc, but get all annoyed at the thought of paying more than a dollar for a piece of fruit. I hope that this double standard will decreases the more people are in contact with ventures like the farmers markets and food co-ops. This initiative is a bold response to “The Inconvenient Truth” of the Food Industry. 3) Farmers to display their social contribution (to low income household, etc) ; along with power/water usage , sustainability measures to enable consumers in making an informed decision. http://www.popcornhomestead.blogspot.com/ along with information about other markets around the country. What the shrooms thay selling? Hi, I am visiting Tokyo In Dec . Will the Farmer’s market be opened on 05-06 Dec 2014? The UNU Farmers Market is only open on Saturday and Sunday. So that would mean 6-7 December.